Margaret Woolsey/Wolsey, widow to James Woolsey, lived in this cottage (now demolished) in 1911. James had been a fisherman and is listed in the 1901 census. Margaret was originally from Co. Waterford. 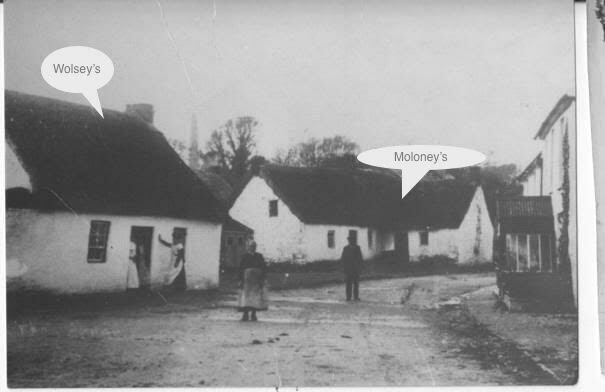 We know she was still living in the cottage in 1916 as there is photographic evidence in The Ardmore Journal (Vol. 1) which shows here waving at a wedding party next to her cottage in 1919. William Mockler’s anecdote about Mags Wolsey gives a sense of the woman. “Mag Wolsey was chapelwoman in Ardmore for 22 years until one evening after having a drop too much she rang the Angelus Bell at the wrong time and was fired by Fr. O'Shea. Later when he was Parish Priest in Ballyporeen he used to visit Ardmore regularly each year for the Pattern and would call in to see her. "I'm as well now Father as the day you fired me from the chapel"